Growing birch trees in central Texas can be a bit difficult. They are not generally well-suited to the hot, dry Texas weather. Information on a birch tree that grows naturally in Texas will be helpful when selecting and purchasing that new birch tree. The river birch tree (betula nigra), also referred to as red birch and black birch, is native to Texas, growing naturally in the Piney Woods and Post Oak Savannah wetland areas. It is a highly heat-tolerant deciduous tree. River birch trees can grow as tall as 90 feet but normally only reach 20 to 30 feet tall with a canopy width of 20 to 30 feet. They grow quickly and usually have multiple trunks. The bark of river birches is commonly rather thick and scaly but occasionally has a smooth texture, with colors ranging from medium brown with a slight pink shade to darker brown with a gray tint. The bark peels off of the tree in thin, paper-like sheets. The medium to dark green leaves of the river birch are 2 to 4 3/4 inches long and 1 1/2 to 3 1/2 wide with a serrated or toothy edge. They turn golden yellow in the fall but do not stay on the tree for long. 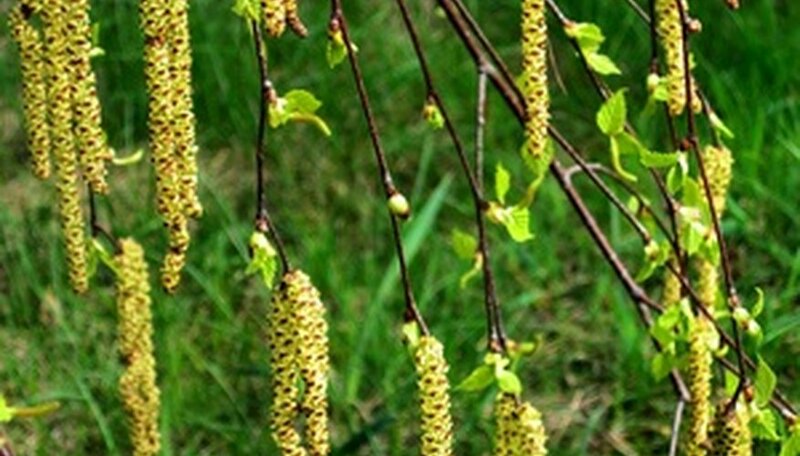 River birch flowers are in 1 to 2 1/2 inch catkins that mature in late spring to release tiny winged seeds or nutlets. River birch trees can be planted in loamy, sandy or clay soil that drains well; the trees prefer an acid to neutral pH. Full sun or partial shade exposure is fine but the soil should be shaded, cool and moist. Plant the river birch on the east or north side of the house, another building or other larger trees so that it is shaded from the hot afternoon sun. Birches have shallow root systems and should not be planted in an area that receives a lot of foot traffic. Place three to four inches of mulch around the tree to help retain moisture. Heritage is a river birch cultivar that grows more quickly and has larger, shiny dark green leaves. The bark begins to peel off the tree sooner to reveal a white or salmon-white bark that turns a salmon-brown color as it ages. Little king is a dwarf variety of river birch that only grows to a height of eight to 10 feet. The bark, leaves and growth habit are similar to the original river birch.